Weld Metal Overlay | Rode Welding Inc. Among our diverse custom metal fabrication capabilities, Rode Welding is proud to offer corrosion-resistant weld overlay and clad welding services. This process is used to join one or more metals together by welding a thin stainless steel or nickel-base alloy layer to the surface of a backing material in order to create a stronger composite product. Weld metal overlaying is a low-cost way for manufacturers to retain the desirable properties of both the base metal and the stainless steel veneer. The process also is highly customizable, allowing manufacturers to choose from a broad selection of materials to layer and alloy multiple surfaces together. 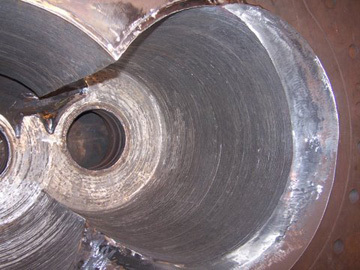 Different weld overlay methods are capable of achieving different surface outcomes based on access, position, type of alloy, dissolution rate, and customer budget. Though typically used to strengthen the base substrate material, weld metal overlaying can yield a multitude of other benefits. Weld Cladding – The application of a thick filler layer to a low-alloy or carbon steel base for corrosion resistance. 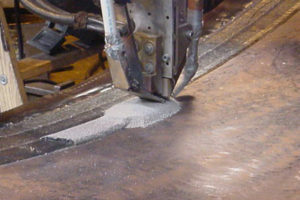 Hardfacing Material – A weld surfacing applied to reduce wear, abrasion, erosion, impact, cavitation, or galling. 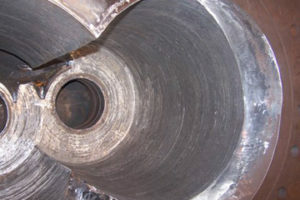 Buildup Alloys – A process that adds metal to a base substrate not for corrosion resistance but rather to restore the piece to — or close to — its original dimensions. Buttering Alloys – Welding one or more layers of metal to a dissimilar surface material to satisfy metallurgical considerations. By weld cladding metals, OEMs can impart the properties of a thin veneer surface onto a base material, therefore saving money that they would have spent on expensive or rare materials with similar properties. Common filler materials come in the form of coiled electrode wire, covered electrodes, and strip electrodes. Once the customer has specified the required base metal, surface chemistry, and thickness, our welding team will select the appropriate filler material for the job. Gas Metal Arc Welding (GMAW) – Automatic and semi-automatic options available for both cold and hot wire. Gas Tungsten Arc Welding (GTAW) – Manual and automatic pulsed and spray transfer options available. Submerged Arc Welding (SAW) – Automatic single wire, multi wire, and series arc options available; the most economical method for large surface areas. These techniques allow our highly trained and experienced welding technicians to overlay materials such as stainless steel and Inconel to the inside or outside surfaces of metal components. Through these processes, we can achieve diverse corrosion-resistant composites such as pipes, pressure vessels, and compressor housings. We hold all of our welders and welding procedures to the highest quality standards including ASME Section IX, AWS D1.1, NAVSEA (MIL-STD-248), and ABS. Our ASNT SNT-TC-1A Level II certified staff inspectors perform rigorous post-fab tests including liquid penetrant, magnetic particle, ultrasonic, radiography, and visual inspections. For over 65 years, Rode Welding has specialized in custom steel fabrications and parts for OEMs and heavy service industries. To learn more about our weld metal overlaying or any of our other welding services, contact Rode Welding today.